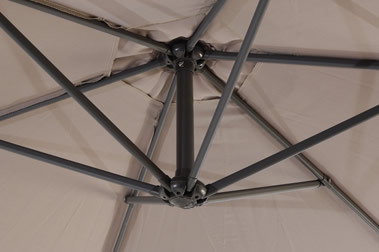 Aluminium Cantilever Sturdi Plus parasols are available in five colours Green, Blue, Natural, Black and Taupe. It comes as standard with the crank feature allowing the parasol to be put up easily. Resin Crank, Hub, Runner, Finial. Round Aluminium parasol, graphite frame, 230gram polyester, 42/48mm pole.